Think Aqua Jogging Workouts are just for grandparents? Think again. Deep water training is used by top athletes and fitness buffs to increase endurance, fitness, power, and strength. Here’s how to dive in and get started. Research shows that people who water exercise can burn as much body fat and build as much muscle as those who engage in land-based exercise programs. Exercising in water builds cardiovascular stamina, strength, flexibility, burns body fat, increases circulation, and can help rehabilitate healing muscles and joints. If your workouts have been drowning in boredom or you’ve hit a fitness plateau, moving your workout into the water will revitalize your motivation and results from your training. Added resistance. You might think you could not possibly get as intense of a workout in water, but research shows otherwise. Water provides 12 to 14 percent more resistance than air, so moving through it is like having weights all around your body. The water acts as a form of built-in resistance, making it simple to increase the intensity of your workout and challenge muscles that are harder to engage on land. Thats why you often see athletes doing high intensity interval training in the pool, they are working against the water’s resistance to increase power. Low to NO impact. Aqua Jogging can be easily tailored to your fitness level, anyone can benefit from water exercise, regardless of age or agility. If you are an athlete or exercise fanatic, you can join top athletes in Aqua Jogging to train harder or recover faster. If you’re overweight, elderly, have arthritis, joint pain, osteoporosis, or an injury that makes weight-bearing exercise difficult or painful, water workouts may be an excellent choice. 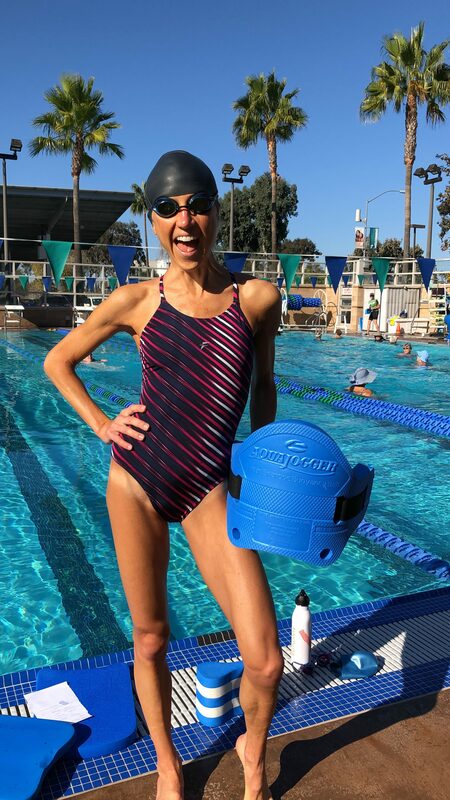 I have created a growing playlist of Aqua Jogging workouts for the members in my Hurt Foot Fitness recovery program – I keep my members FIT, motivated, and fueled with endorphins! Increased flexibility. Because water lessens the effects of gravity, you’re able to move your body through a wider range of motion, which improves flexibility. Improved lung capacity. Even your lungs get a solid workout because the water pressure makes them work harder than they would on land. Cross training and Exercise variety. If you’ve been hitting a plateau and NOT seeing results, Aqua Jogging would help you MIX it up! 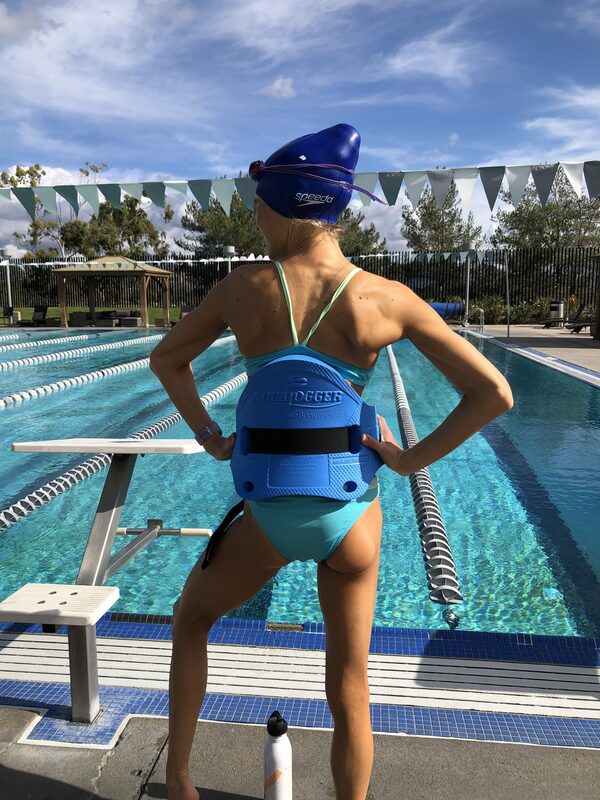 You can use Aqua jogging to cross-train for sports, enhance recovery, break through plateaus, add variety, work different muscles, and avoid overuse injury (or recover from one). It really is one of the best cross training exercise options available! Ive experienced all of these benefits and more. Ready to join me in the pool? Here’s what you’ll need to get started. Buy a belt, swimsuit, and goggles. The brand that INVENTED Aqua Jogging is the best on the market. Use the code “CarolineJordan” for 20% off AquaJogger Sport Belt Products here. Find a deep water pool. The swimmers guide online has a great directory of pools near YOU. Bring a friend (or two). Personally I enjoy exercising with friends! Add music. Sometimes pools play music on the pool deck (they do this where I aqua jog at the YMCA and its so helpful). If theres no music, you might want to check out the waterproof headphones for swimming/water exercise. Use the clock. There is a pool clock at most traditional pools. USE IT for your workouts! Time the length of your laps, do fixed intervals (30 seconds on/30 off), create workout sets and drills. The clock is a powerful tool for making the most of your time in the pool. PUSH yourself. When I Aqua Jog, I wear my waterproof Fitbit Versa watch. This watch shows my steps, exercise time, heart rate, and other valuable data on my activity. When I Aqua Jog, I like to challenge myself to see how many steps I can get during a workout or how high my heart rate can come up during deep water HIIT drills. Wearing the watch in the pool showed me just how much pushing my Aqua Jogging workouts could get my heart rate up and challenge my body! Sweat, smile, and repeat. To really reap the aerobic training benefits of AquaJogging workouts, you want to try to go for at least 30 minutes. A good recommendation for adding Aqua Jogging into your weekly fitness routine would be 2-3 times a week for 30-45 minutes. If you are training for something specific (like a longer endurance race), your training would reflect that (longer workouts or specific strength exercises in the pool). My Aqua Jogging Workouts leave me sore in all the right places, without the aches and pains that come from higher impact activities. I’ve become addicted to how good they feel, now I carry my AquaJogger belts with me in the trunk of my car, just incase I find a pool to jump into. Give it a try and you’ll see that Aqua Jogging can be high intensity, seriously challenging, and feel amazing. Don’t believe me? You clearly haven’t exercised in the pool yet with me. Im positive that with the right coach and workout, your booty would be KICKED. Here’s one of my favorite Aqua Jogging workouts so you can try it for yourself.